Fortran has been the premier language for scientific computing since its introduction in 1957. Fortran originally was designed to allow programmers to evaluate for- las―FORmula TRANslation―easily on large computers. Fortran compilers are now available on all sizes of machines, from small desktop computers to huge multiproc- sors. 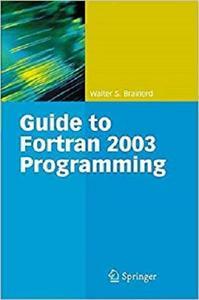 The Guide to Fortran 2003 Programming is an informal, tutorial introduction to the most important features of Fortran 2003 (also known as Fortran 03), the latest standard version of Fortran. Fortran has many modern features that will assist the programmer in writing efficient, portable, and maintainable programs that are useful for everything from “hard science” to text processing. Target Audience This book is intended for anyone who wants to learn Fortran 03, including those fam- iar with programming language concepts but unfamiliar with Fortran. Experienced Fortran 95 programmers will be able to use this volume to assimilate quickly those f- tures in Fortran 03 that are not in Fortran 95 (Fortran 03 contains all of the features of Fortran 95). This guide is not a complete reference work for the entire Fortran l- guage; it covers the basic features needed to be a good Fortran programmer and an - troduction to the important new features of Fortran 03. Many older error-prone features have been omitted and some of the more esoteric features that are new to F- tran 03 also are not discussed.